WASHINGTON (AP) — The U.S. special forces unit ambushed by Islamic militants in Niger didn’t call for help until an hour into their first contact with the enemy, the top U.S. general said Monday, as he tried to clear up some of the murky details of the assault that killed four American troops and has triggered a nasty political brawl. 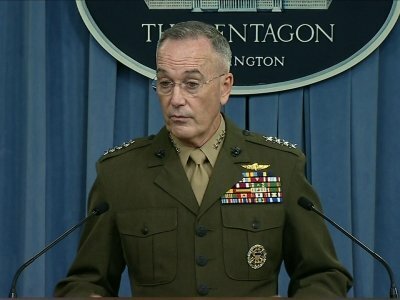 Marine Gen. Joseph Dunford, chairman of the Joint Chiefs of Staff, told reporters that the American people and the fallen soldiers’ families deserve answers about the deadly ambush in the west African nation. But he said he still lacks many of the details about how the attack unfolded, and he asked for patience as the military investigation continues. Dunford’s description of the incident, however, underscored how long the mid-morning attack dragged on, and that it was many hours before the wounded and killed were evacuated. He said that “within minutes” after the unit called for assistance, a U.S. drone was moved into position overhead, providing surveillance and full-motion video. He declined to say if it was armed, but said it did not fire. Another hour went by before French fighter jets arrived, but the wounded weren’t taken out until later in the afternoon when French helicopters arrived along with additional Niger troops. The bodies of the three Green Berets who were killed were evacuated that evening, he said. Dunford acknowledged that nearly three weeks after the attack, many questions remain. They include whether the U.S. had adequate intelligence, equipment and training, did they have an accurate assessment of the threat in that area, how did they become separated in the fight and why did it take so long to recover the body of Sgt. La David Johnson, who was missing for two days before his body was found by Niger troops and turned over to the U.S. He said the 12-member Army special forces unit accompanied 30 Nigerien forces on a reconnaissance mission to an area near the village of Tongo Tongo, about 85 kilometers north of the capital on Oct. 3. They ended up spending the night there, and when they were returning to their base the next morning, they encountered about 50 enemy fighters traveling by vehicle, carrying small arms and rocket-propelled grenade launchers. Independent of the events surrounding the attack, Johnson’s death and his family’s ordeal have become a major political dispute. After Johnson’s body was returned to the U.S., President Donald Trump credited himself with doing more to honor the dead and console families than any of his predecessors. Then, Johnson’s aunt said Trump showed “disrespect” to his family as he telephoned to extend condolences. In an extraordinary White House briefing, John Kelly, the former Marine general who is Trump’s chief of staff, shot back at Trump’s critics, and the president continued the criticism over the weekend. Members of Congress are also demanding answers. Last week, Sen. John McCain, the Republican chairman of the Armed Services Committee, even threatened a subpoena to accelerate the flow of information from the administration. Dunford defended the broader American mission in Niger. He said U.S. forces have been in the country intermittently for more than two decades. Currently, some 800 U.S. service members are supporting a French-led mission to defeat the Islamic State, al-Qaida and Boko Haram in West Africa.